Bigelow Bros. & Kennard was a successful store in Boston that ran from ca. 1824 until 1971. Evelina and Oakes were familiar with it, as many of their children, grandchildren and great-grandchildren would be as well. Evelina took a cuff pin – a women’s version of a cuff-link – to Bigelow’s to be marked. As the crow flies, the distance from Boston to North Easton is approximately 21 miles. The distance on the available roads was closer to 23 miles. Given the speed at which a wagon might travel along a nineteenth century road with a predictable distribution of hills and curves, a journey in 1851 from one location to the other could conceivably take all day. As already proven yesterday, however, when Oakes and Evelina made the trip in from North Easton in time to shop before lunch, the Ames’s horse Kate could move right along. Kate (also spelled Cate) was well-known in North Easton. She had a sense of purpose and style all her own. Oakes had taught her to respond with speed when someone tried to rein her in, and he enjoyed tricking the occasional wagoneer who tried to slow Kate down with a normal tug on the reins. Kate would simply go faster, especially if she were headed for home. Thus, Evelina wasn’t exaggerating when she wrote that Kate was going too fast for her to see everything. Evelina wasn’t able to properly scrutinize the fine homes along the road in Jamaica Plains, some of which were quite big and beautiful. Another trip to Boston called off by weather. Not only were Evelina’s plans put aside, but Old Oliver’s plans must have been challenged, too. Haying had begun the day before and the rain not only obviated any further haying today, but also endangered the hay that had already been cut. Evelina experienced an odd satisfaction today, pleased that the weather proved to be as bad as she had anticipated because it justified her choice not to go to town. Perhaps she wasn’t pleased so much as vindicated. As she had done last week, she turned to sewing and mending to fill the time that otherwise would have been spent in Boston. Oakes Ames, meanwhile, presumably went on into the city to conduct business with various store owners who sold Ames shovels. 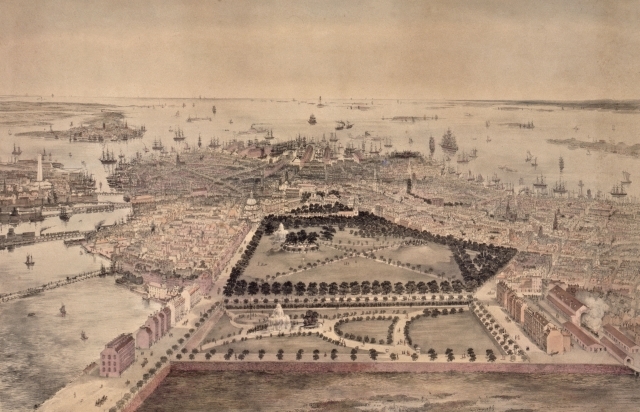 As the illustration above shows, Boston at this time had a much smaller perimeter than the city we know today. 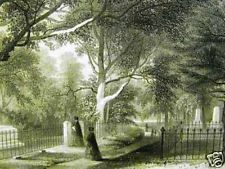 Back Bay was still a small bay of water, and the line of trees at the bottom of the illustration formed the western edge of the city, along the line that is now Arlington Street. The filling in of the water that would create the Back Bay grid of streets wouldn’t begin for another five or six years. 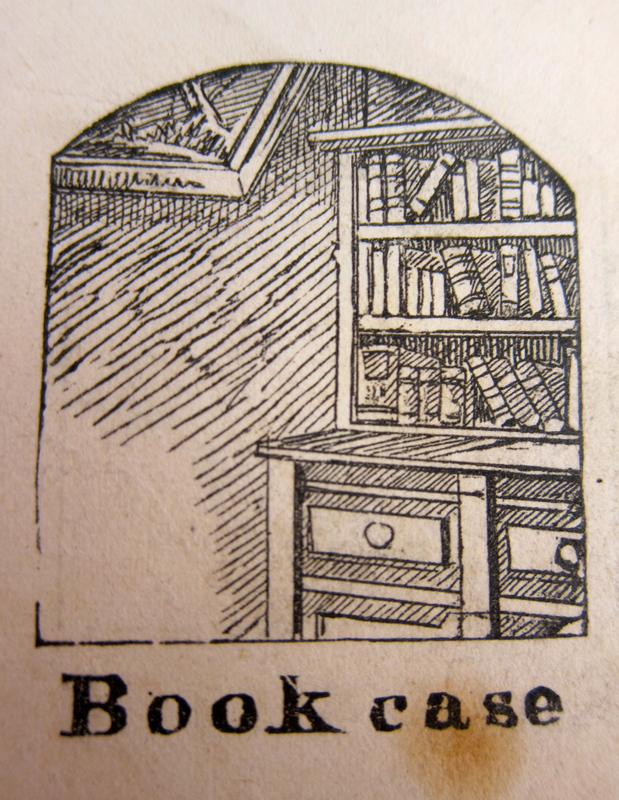 A young carpenter named Ira Ford built a bookcase at the Ames house today in the bedroom of Oakes Angier and Oliver (3). The boys had acquired schoolbooks and other “books enough” and needed a place to store them all. Like their mother and unlike their father, the Ames sons like to read. The middle son, Oliver (3), in particular, cherished reading. According to an unnamed eulogist in a memorial volume published in 1895, Oliver (3) built up quite a collection of books in his lifetime: “In the company of books he found an absorbing pleasure, and to the library which he had begun to collect in his early age he made in later years large additions of rare and valuable volumes.”* After Oliver (3)’s demise, those books that weren’t kept by his family were auctioned off at Sotheby’s. The Hockomock Swamp is a vital wetland of some 17,000 acres in southeastern Massachusetts, a minor portion of which occupies a southernmost section of land in Easton – land not far from the Gilmore farm. It’s an ill-omened, storied spot, known today as part of the”Bridgewater Triangle,” so-named in the 20th century as a location for UFO sightings, ghost lights, foxfire, animal mutilations and the like. A “place where spirits dwell,” the Wampanoag Indians called it, and they would know. Much of King Philip’s War, in the late 17th century, was fought in the environs of the Hockomock. Metacomet hid there. It’s ironic that in 1851, two young farm hands who were working for Evelina’s own brother, Alson Gilmore, went for a swim in the “Hockemok Meadow” after work and drowned, adding their tragic story to the swamp’s paranormal reputation. ** William Chaffin, History of Easton, 1866, pp. 454-455. Stuck at home when she had planned to be in Boston, Evelina was clearly sorry to have misjudged the weather and missed the trip. Oakes was in town and she wasn’t, and she had little choice but to turn to her sewing. She coped with her disappointment by handing it over to providence and accepting the change of plans as “for the best.” God knew better than she did. Susan Ames was possibly less philosophical about the change of plans. 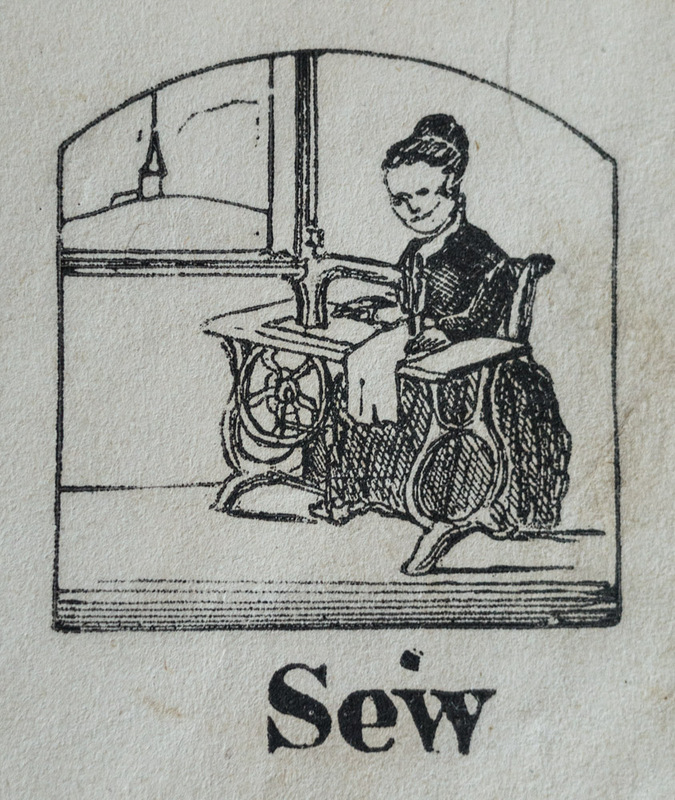 Her mother put her to work sewing, for which Susie had neither inclination nor aptitude. In an era when society decreed that a “woman who does not know how to sew is as deficient in her education as a man who cannot write,”* Susie was expected to acquire at least the fundamentals of needle and thread whether she liked it or not. Neither Susan nor her mother could know that mechanical machines for sewing would soon be introduced that would obviate hand-sewing. The illustration above, from 1877, a quarter-century later, suggests how readily the sewing machine would replace hand-sewing and how quickly the production of clothing would become an industry. Although bespoke clothing would never disappear, and many women for personal or economic reasons would continue to sew their own clothes, ready-to-wear clothing would become more and more available in Susie’s lifetime. No one in the Ames sitting room could envision that development on this sunny summer Saturday ten years before the Civil War. Evelina was disappointed not to travel into Boston today; the possibility of bad weather put her off the jaunt. However, she got to see William Gilmore, her new great-nephew. Her niece-in-law, Hannah Lincoln Gilmore, and the baby seemed to be doing well, which must have been a relief. In an era when childbirth could be dangerous for mother and infant, Hannah and Willie were doing fine. Yet here was alcohol being prepared in Evelina’s own kitchen. Rather than being made to be served as a beverage, however, it was being prepared for culinary and medicinal purposes and, for such cases, it was evidently permissible. In cooking, wine or cider could be used as a preservative in mincemeat pies, for instance. An even more viable use was as medicine for the sick. In Little Women, Mr. March stores away some wine bottles for his invalid daughter, Beth. In Evelina’s kitchen, the homemade wine would probably be served to someone who became ill and needed a tonic. 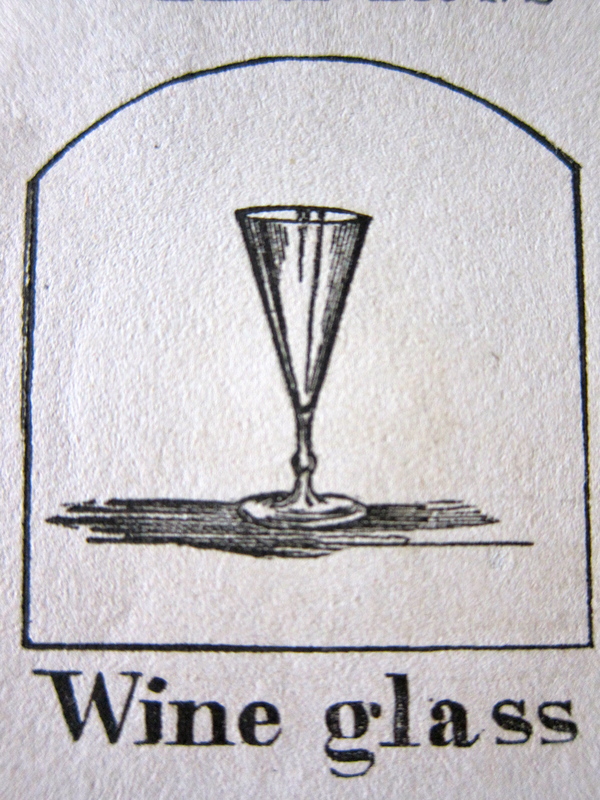 A drink called wine whey, made from strained wine and milk, was a common treatment for fever and other ailments. Wine had its uses; distilled liquors did not.